I really need to learn how to pose properly. Maybe I’ll start doing all the cliche fashion blogger poses just so I can not look so awkward. Anyways. I love this dress, poofiness and all. 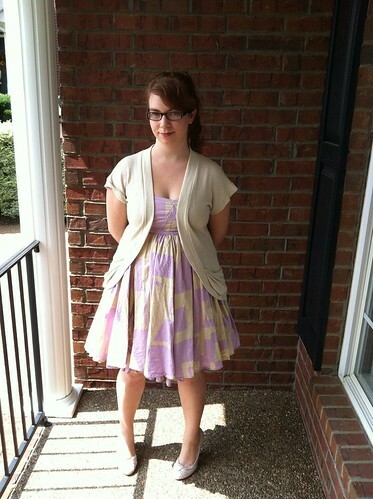 It’s a full gathered skirt with a full gathered underlayer, so it can be somewhat ginormous. All right, maybe not somewhat. Maybe really ginormous. But it’s cute, right? Well, I at least paired it with heels, which gave me the somewhat ungainly look of a top-heavy flower on a too-skinny stem. But I was comfortable and I felt cute, and that’s all that matters, right? The high school students are all on their beginning-of-the-year retreat, so I have very little to do right now. Today I just worked on things for the school play for two hours, then had aftercare with only the middle schoolers. So yeah. Quiet. I didn’t need to do much. But I still looked cute! We’ll just ignore the “I don’t feel like caring today” ponytail. « Tuesday’s Ten: OPI Mini Goodness!